Miller Park, located in the heart of Chattanooga’s Innovation District, is nearing the end of a $10.3 million project to bring the park up to street level, making it more inviting and accessible. Spackman Mossop Michaels (SMM), a landscape architecture firm, and architecture firm Eskew Dumez Ripple (EDR) partnered on the project. 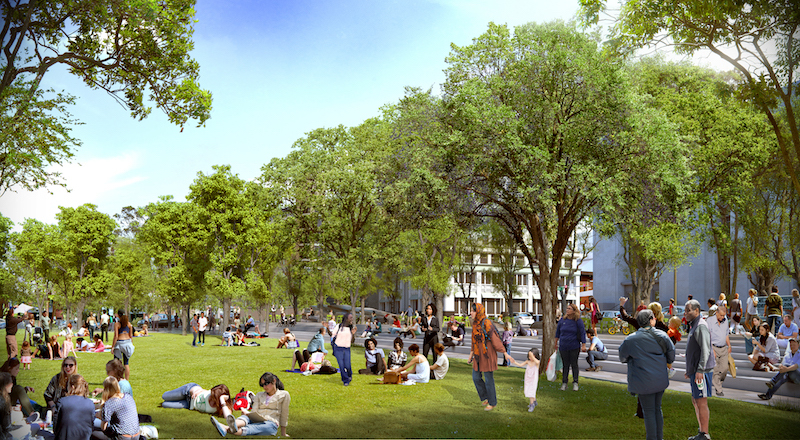 The project connects Miller Park with the existing Miller Plaza across the street through a “shared street” approach. The firms reconfigured Martin Luther King Boulevard to connect the two areas and create one unified civic space. 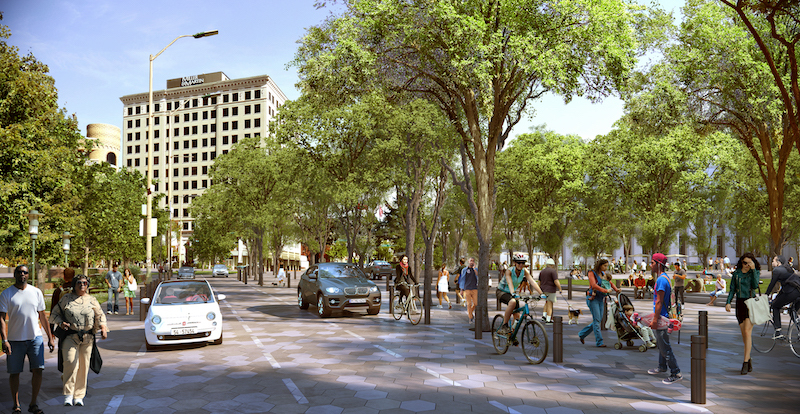 This process included reducing traffic lanes, removing traditional curbs to bring the road and sidewalk to the same level, and planting a flush median strip with native trees to slow down traffic and encourage more pedestrian activity throughout the park. Over 75 new trees were planted and an expansive soil cell system was installed to allow the tree roots to grow large and wide without disrupting the pavement. The soil cells will allow the trees to grow large and eventually create an urban forest while also providing stormwater management that reduces the amount of water that enters the combined sewer overflow systems. In addition to providing an abundance of nature, the new Miller Park is also strong in the technology department. The space is designed to accommodate cultural events and technologically-advanced productions. Free high-speed wifi is available throughout the park and an underground system of internet cables and electricity can support high-tech digital art installations and performances. EDR designed a pavilion for the space that includes a digital projector. This pavilion, when combined with the adjacent open lawn, creates a space for community events such as outdoor movie screenings and live performances. Miller Park is scheduled to open on Sept. 14. The city is working for better efficiency and sourcing green power to reach its goal.